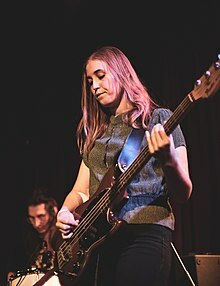 Harriette Pilbeam (born 4 May 1993), known professionally as Hatchie, is an Australian singer-songwriter and musician. She released her debut EP, Sugar & Spice, in 2018. Harriette Pilbeam was born on 4 May 1993 in Brisbane. She started singing as a child, later learning guitar and bass in her teen years, as well as piano and clarinet later on. She studied entertainment, music, and management in college before pursuing live music as a creative outlet. She's the bassist and vocalist of the indie rock band Babaganouj, as well as a former member of the band Go Violets, which disbanded in 2014. Pilbeam made her solo debut under the name Hatchie, her family's nickname, with the release of her debut single "Try" in May 2017. The single gained her significant attention in her native Australia. She then signed with Ivy League Records and released her second single "Sure" in November 2017. In January 2018, she also signed with Double Double Whammy and Heavenly Recordings. In February, "Sure" was remixed by Cocteau Twins' guitarist Robin Guthrie. She released two more singles, "Sugar & Spice" and "Sleep", before releasing her debut EP Sugar & Spice on 25 May. The EP consists of the four previously released singles as well as one additional track, titled "Bad Guy". On October 24, 2018, Hatchie released a new single titled "Adored" for Adult Swim's singles series. Stereogum described Hatchie's music as "a cosmic concoction of dream-pop and shoegaze." Her sound has been compared to various acts, some which she herself cites as influences, including Cocteau Twins, the Sundays, Mazzy Star, Natalie Imbruglia, and the Cranberries. She also cited My Bloody Valentine, Kate Bush, Alvvays, Siouxsie Sioux, Kylie Minogue, Sky Ferreira, Wolf Alice, Chairlift, and Carly Rae Jepsen among her influences. ^ a b "Hatchie Interview: Brisbane Dream Pop Act Talks 'Sugar & Spice'". Stereogum. 7 May 2018. Retrieved 29 May 2018. ^ a b "Introducing Hatchie, the Dream-Pop Idol of Tomorrow". Pitchfork. 4 May 2018. Retrieved 27 May 2018. ^ a b c d "Hatchie | Biography & History". AllMusic. Retrieved 29 May 2018. ^ @hihatchie (4 May 2017). "Just in time for my bday and the one year anniversary of my first release" (Tweet). Retrieved 29 May 2018 – via Twitter. ^ "RIP Brisbane's Go Violets, we hardly knew ye". Faster Louder. 20 March 2014. Retrieved 29 May 2018. ^ "Brisbane's Hatchie Signs To Ivy League Records". theMusic. 14 November 2017. Retrieved 31 May 2018. ^ "Sure - Single by Hatchie on Apple Music". Apple Music. 14 November 2017. Retrieved 31 May 2018. ^ "New Signing & Single: Hatchie 'Sure'". Heavenly Recordings. 29 January 2018. Retrieved 31 May 2018. ^ "Hatchie Signs to Double Double Whammy!". Double Double Whammy. Retrieved 31 May 2018. ^ "Sure (Robin Guthrie Remix) - Single by Hatchie on Apple Music". Apple Music. 23 February 2018. Retrieved 31 May 2018. ^ "Sugar & Spice - EP by Hatchie on Apple Music (United States)". Apple Music. 25 May 2018. Retrieved 29 May 2018. ^ "Sugar & Spice - EP by Hatchie on Apple Music (Australia)". Apple Music. 25 May 2018. Retrieved 31 May 2018. ^ "Hatchie Shares New Song "Adored"". Pitchfork. October 24, 2018. Retrieved October 25, 2018. ^ Moreland, Quinn (4 May 2018). "Introducing Hatchie, the Dream-Pop Idol of Tomorrow". Pitchfork. Retrieved 29 May 2018. ^ "Shoegazey with a Dream Pop Edge: Introducing Hatchie". Noisey. 7 June 2017. Retrieved 29 May 2018. ^ Minsker, Evan (26 February 2019). "Hatchie Announces Debut Album, Shares New Song "Without a Blush": Listen". Pitchfork. Retrieved 26 February 2019. Wikimedia Commons has media related to Hatchie. This page was last edited on 17 March 2019, at 03:01 (UTC).